Funeral Directors and Embalmers in West Virginia are required to complete 7 hours of continuing education every two years, including 4 hours of OSHA. The deadline is July 1st biennially. 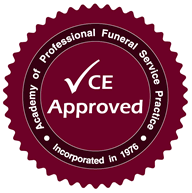 The following courses are approved by the West Virginia Board of Funeral Service Examiners.